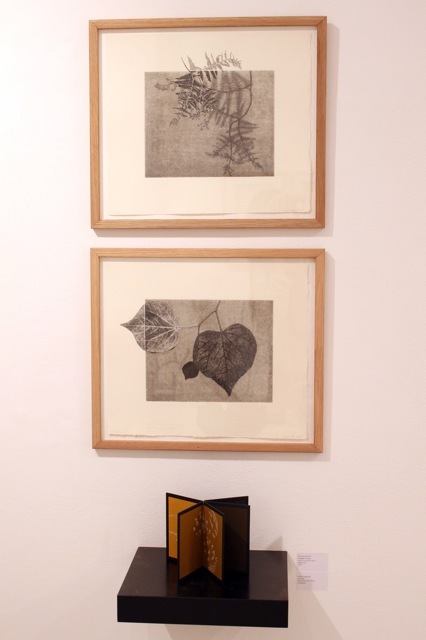 In a time when words and images seem to evaporate into the ether, this show brings together works of words on different styles of leaves. 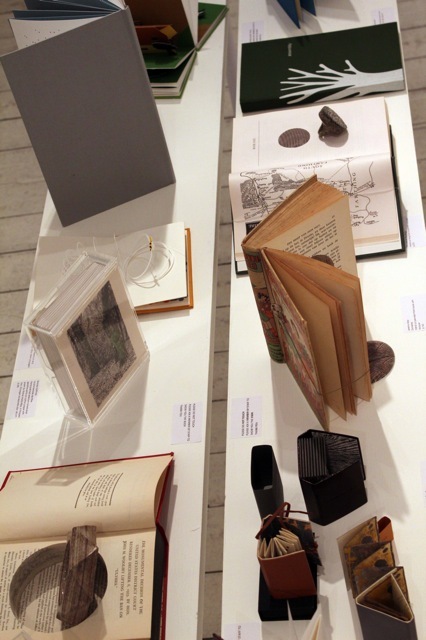 Some loose, some bound - from letters, maps, novels, packaging or specially printed - each work renders a tactile reality. Some small, like gems; some exploding beyond the pages, each work inspires a journey through the imagination. 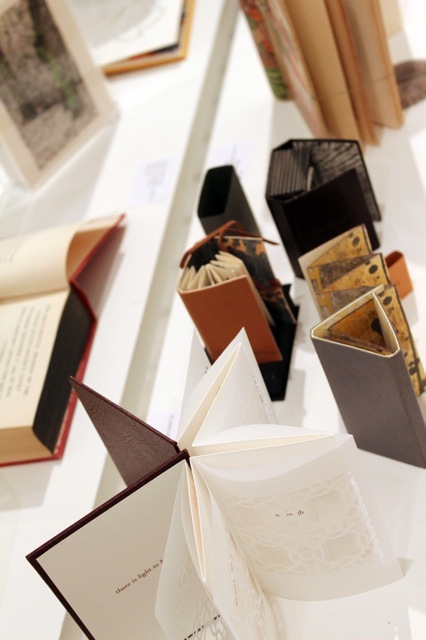 Artists books are a curious device. On the outside, just like many other books, but once opened seeming to reveal more of the artist and creating a more intimate relationship between artist and viewer. Literal interpretations of the environment, representations of mapping as well as more abstract concepts about our individual finite existence and our relationship with home find their way into Louisa Boyd’s pieces. Tradition, both familial and cultural, lies at the heart of her practice, which considers memory and knowledge and how this is transferred across generations. “Stardust” contemplates the place of the human within the physical world. The figure is positioned at the edge of the concertina book and looks out towards a vast landscape that itself is dwarfed by an even more vast depiction of the sky. 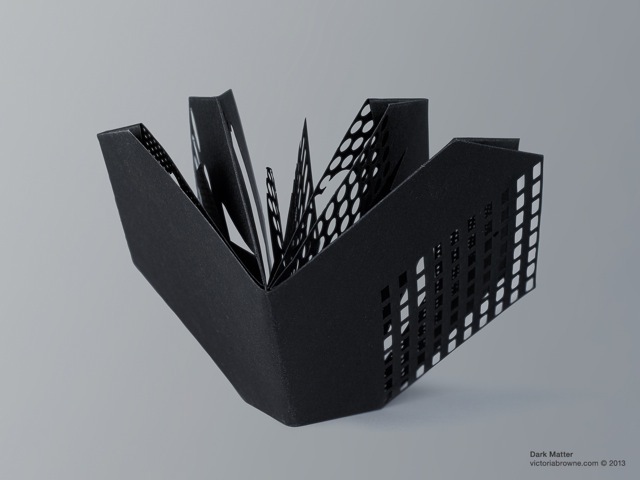 The night sky extends onto the end papers of the book, with holes punched from the paper to allow the extension of the piece beyond its physical confines. Victoria Browne’s practice draws on public special collections to appropriate material research, applying traditional and innovative print techniques in the development of site responsive artworks. She is the founder of KALEID editions, an artist-led platform representing the best of European-based artists who do books, acquired by leading institutions worldwide for academic research and future public access. 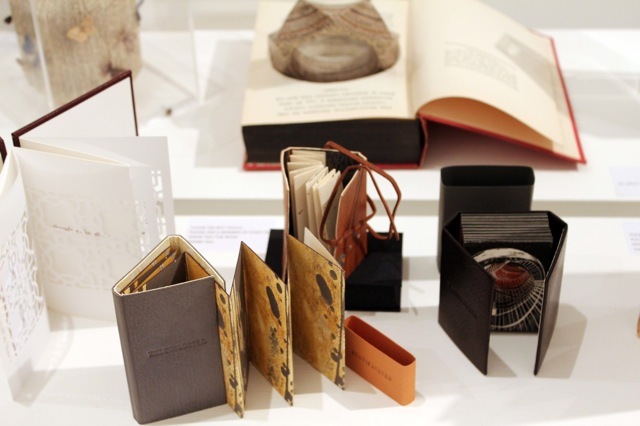 As the recipient of two Birgit Skiöld Memorial Trust Awards for excellence in her artists’ books, Browne’s bookworks have been acquired internationally and she regularly delivers participatory projects, lectures, and presentations. 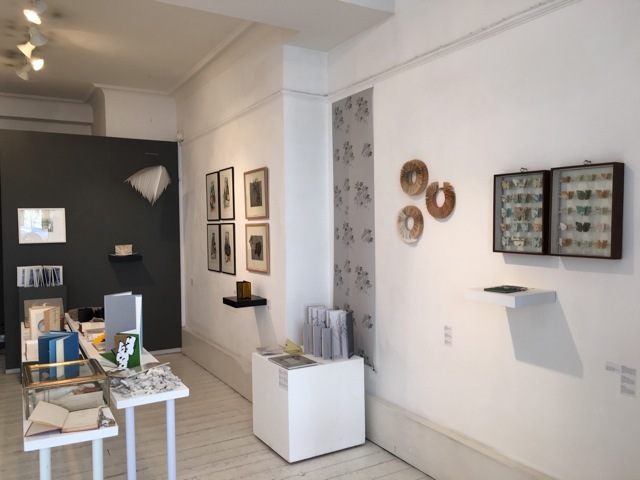 In 2013 she was nominated by Gill Saunders, Senior Curator of Prints at the V&A Museum and shortlisted for The British Arts Foundation Printmaking Fellowship Award. For many years Tracey Bush made scrapbooks, collections of ephemera that could not be thrown away. 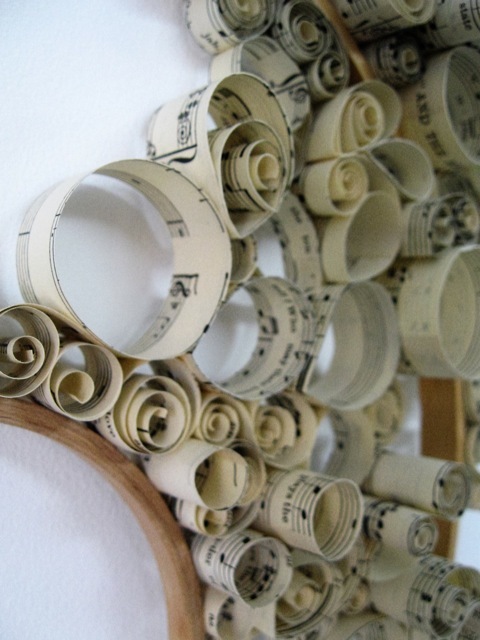 The use of scraps is a way of recycling both materials and images in a process of reconstruction. These books have now emerged as Lepidoptera; butterflies and moths, ancient symbols of transformation. 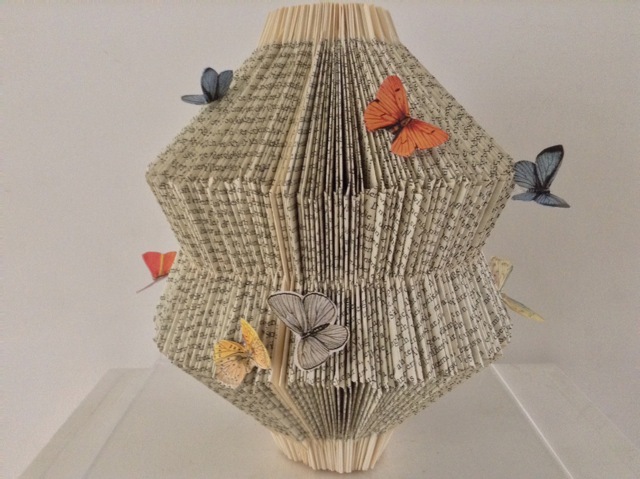 Each moth or butterfly is hand-cut from layers of recycled papers and then sewn together using a bookbinders pamphlet stitch. They are then pinned out in entomological boxes. 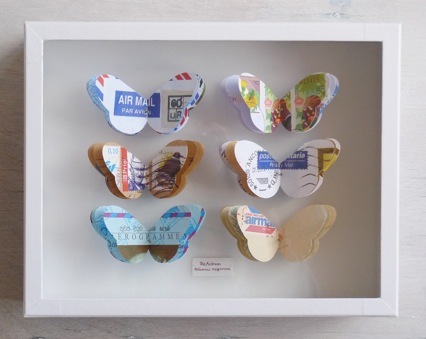 Butterflies are cut from envelopes postmarked from around Britain or from vintage maps of the British Isles. 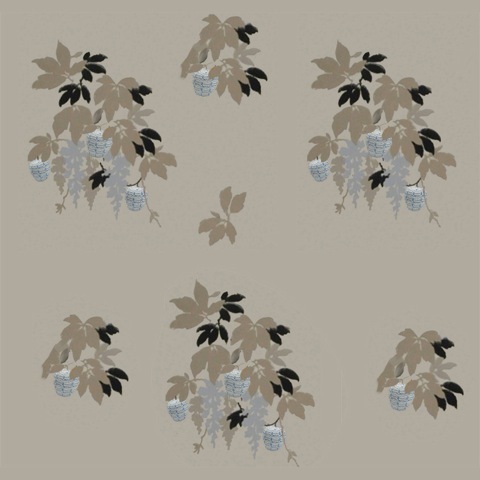 There are quirky links between the butterfly name and the material used. Their poetic names are hand-written in brown ink on tiny scientific labels. 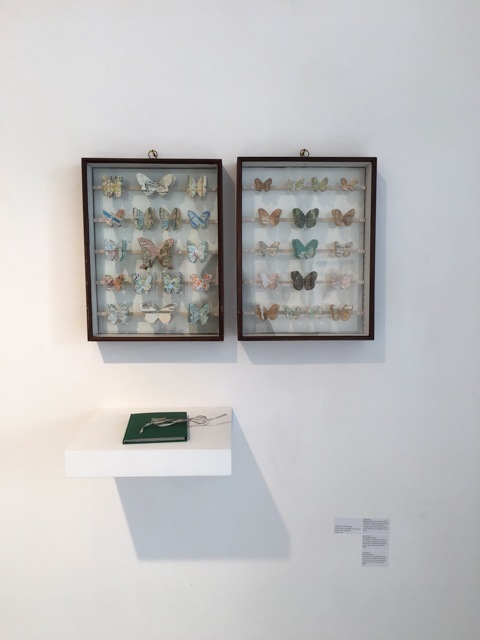 Butterflies are amongst the first indicators of environmental change; these collections hope to highlight their frailty and diversity, as an alternative to a collection of actual specimens. 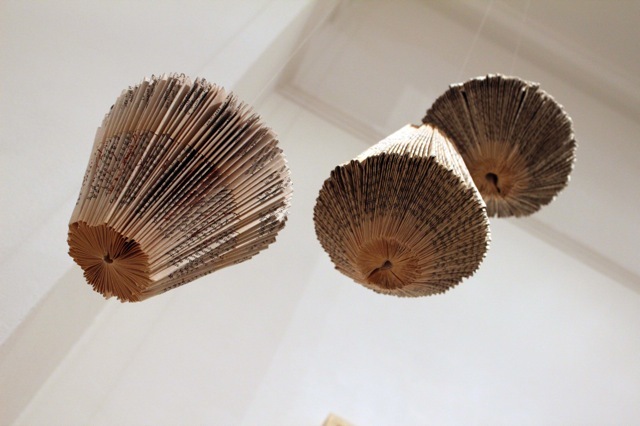 Nicola Dale’s sculptures visualise the acquisition of knowledge. 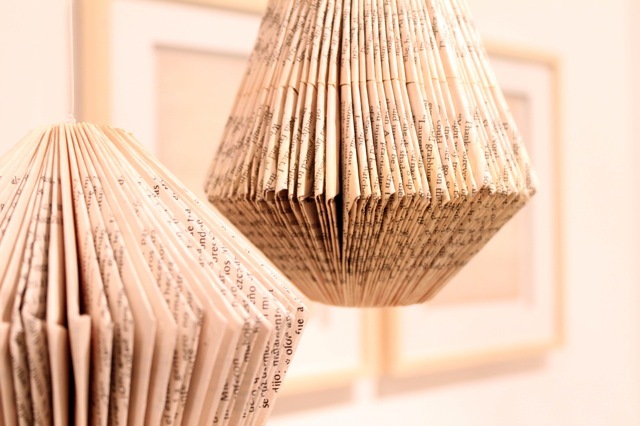 She is intrigued by the irreversible transition from the materiality of books, libraries and institutionalised learning to the intangible data overload of the digital world. She examines the difference between knowledge and information. Defying the ease, speed and perfection with which artworks can now be made digitally, Dale’s sculptures revel in slow, human imprecision. 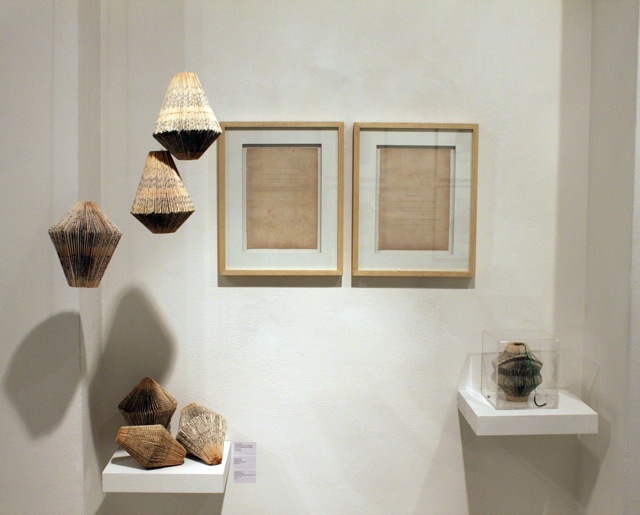 She uses ephemeral or natural materials for their capacity to retain the impression of her imperfect touch. Underpinned by a rigorous attention to process, she investigates what her hands can achieve with minimal apparatus. Her work takes time. Her pieces shiver with multiple focal points. They require the viewer’s eyes to move, scroll and refresh. They are defiantly positioned in real time and solid state. Argentinean artist Monica Fierro will present a site- specific installation for the show. 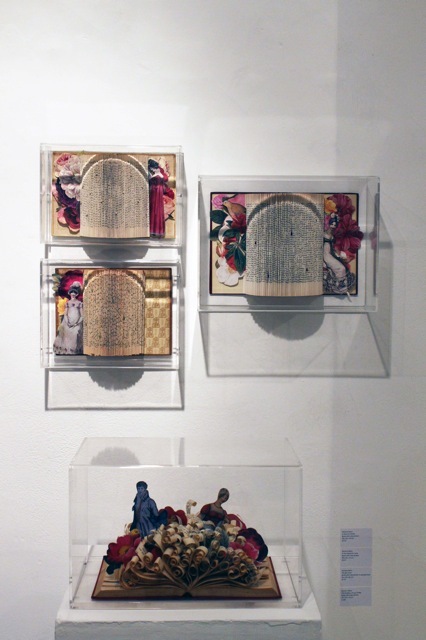 Working with old, damaged books, her practice has been inspired by embroidery, sewing, textiles and clothes making practiced by the women in her family. Her books reveal feminine characters, particularly from illustrated English books from XVIII Century. 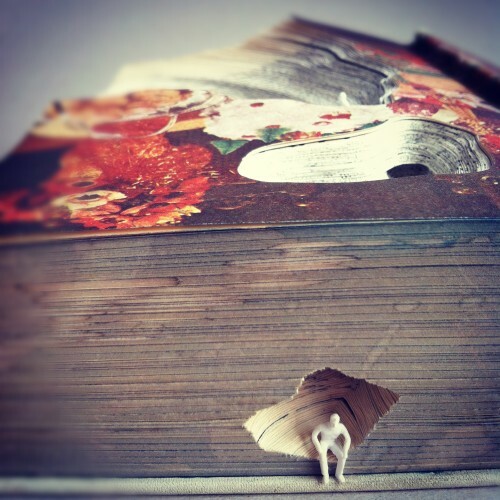 Her heroines appear from the curled up or folded cut out pages becoming exquisite sculptures. “The books become like spaces behind the scenes or ‘mis en scenes’ where young ladies, gentlemen, flowers or birds crop up, dialogue and disappear, depending on the story I wish to tell”. 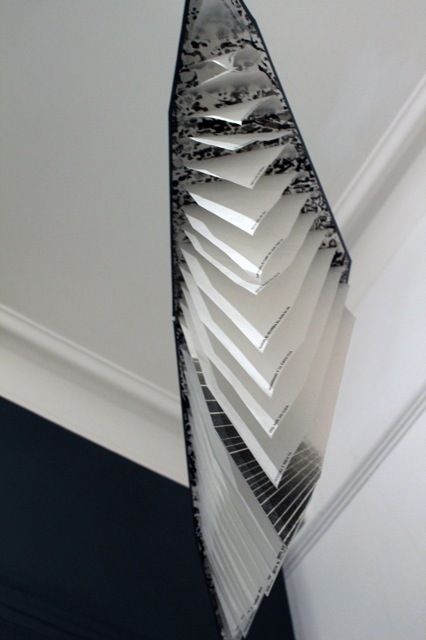 Yvette Hawkins is a visual artist of British-South Korean origin working across installation and sculpture. Her work explores themes that encompass hybridity, tradition, migration and preservation, relating to ‘the cultural other’ and specifically about her mixed race, heritage and nomadic upbringing - occupying forty five homes across two nations. Craft also plays an important role in the making of work, often involving traditional skill centered techniques such as bookbinding, embroidery and printmaking. Brenda Hoffman’s presents "Aleph, rue de Charonne" after Jorge Luis Borges’s tale The Aleph. In this work Borges tells the story of a man who finds a hidden point between the steps of the stairway that led to his basement. Through that point it was possible to see the universe and all that happens in this world: past, present and future. For many years Brenda lived in a flat on the Rue de Charonne where she had an Aleph on the ceiling, through which she could glimpse the sky. The same yet different sky, sometimes of an intense blue, sometimes dark, menacing, tempestuous, with clouds, the same sky since the universe was created but always changing. The sky, just like the movement of time, is permanent like the seasons, but our passage through the earth is just fleeting. 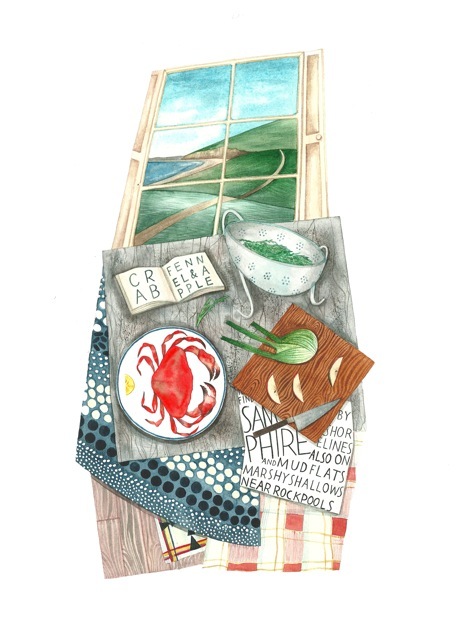 Naomi Howarth’s delicate watercolours are inspired by recipes that use locally and seasonal sourced ingredients from around the British Isles. 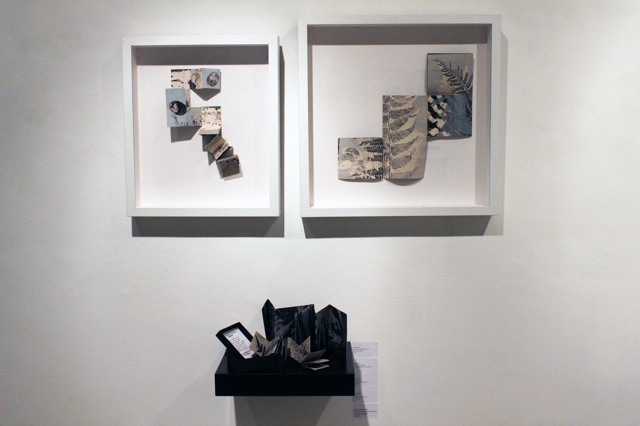 Juxtaposing texts and images, her works capture scenes of quiet domesticity, characterised by a flattened perspective, organic yet angular forms, and a sensitivity to the textures of objects. Deceptively simple, these works often feature an open door or window, constructing a scene within a scene and inviting the viewer into a unique pictorial world. Naomi is a published children’s author and illustrator. Her first book, The Crow’s Tale, has been shortlisted for the Waterstone’s Children’s Book Prize 2016. Layering a variety of printing techniques and juxtaposing different themes, a richness and veiled quality is present in Katherine Jones’s provoking prints. 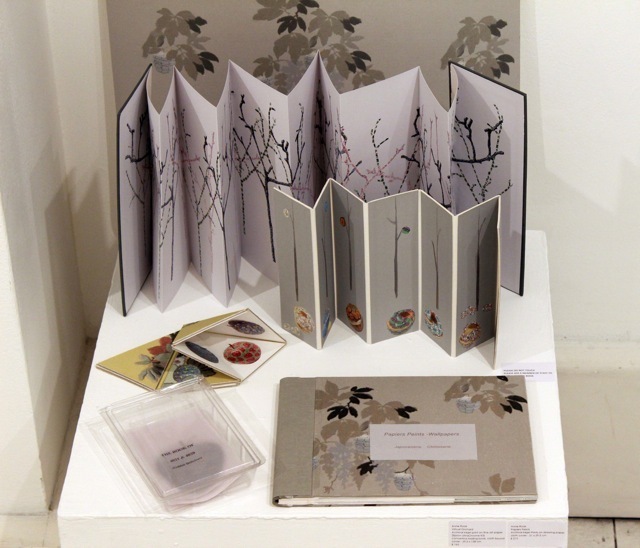 Katherine has also made two editions of artists’ books, Bubble High and High Light Bell. 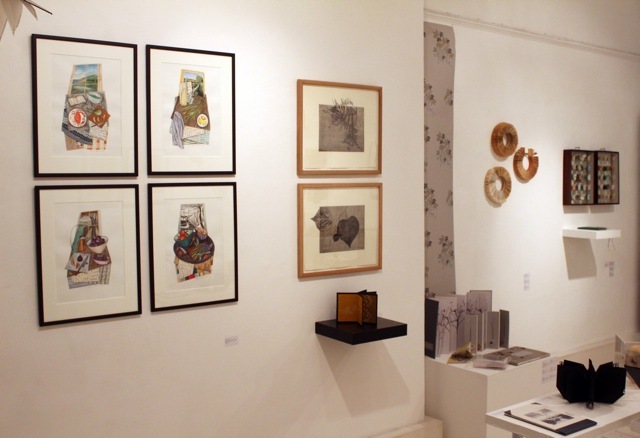 Her recent book comprises 32 etchings half of which were made (drawn, etched and printed) at Eton College during her residency there in the autumn of 2015 and began with simple observational drawings of the College. The other half were made about the Tulse Hill Estate in South East London at the beginning of this year. 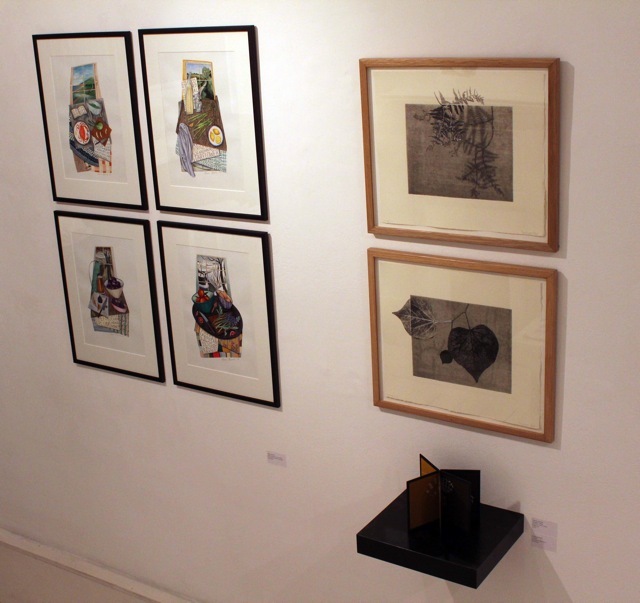 The Eton etchings have also been printed individually in colour and exist as a portfolio entitled 'Looking In' and are also available to buy individually. 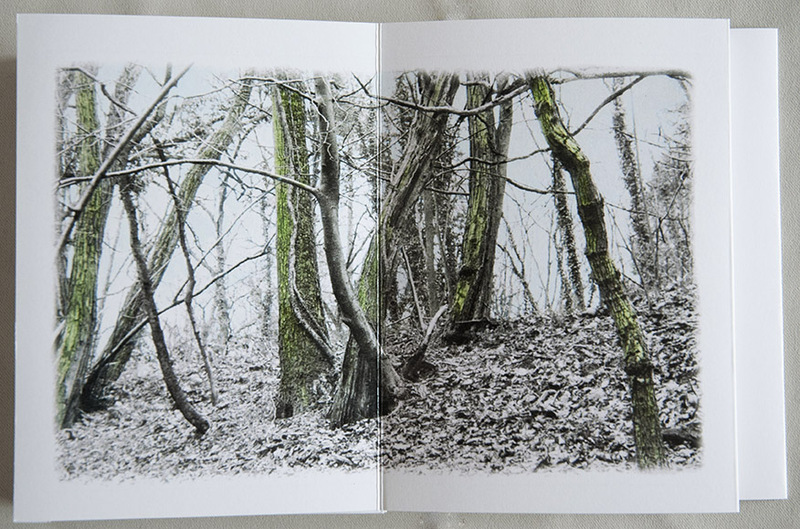 The book which has the working title 'My Estate, Your Estate' has been completed especially for the show at jaggedart. 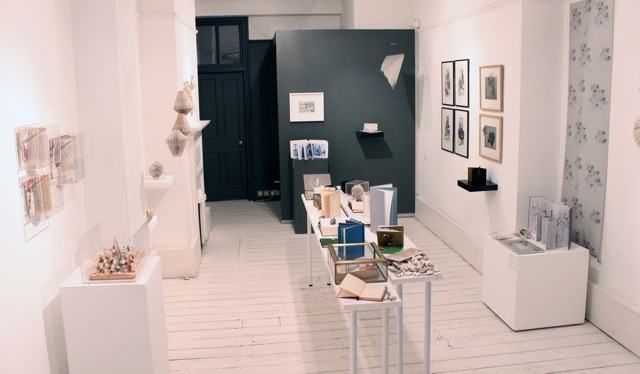 Since completing her MA in printmaking at Camberwell College of Art in 2003, Katie has been awarded numerous print-making prizes, including the Birgit Skiold Memorial Trust Award of Excellence, for The National Art Library V&A Whitechapel Artists Book Fair 2010, book Research Fellow at City and Guilds of London Art School, 2007-10, Pushing Print Award 2009 and the Northern Print Biennale Solution Group Prize 2009. The Royal Academy of Arts have invited her to take part in an exhibition Painter Printmakers in 2014 in the Royal Academy's Keeper's House. 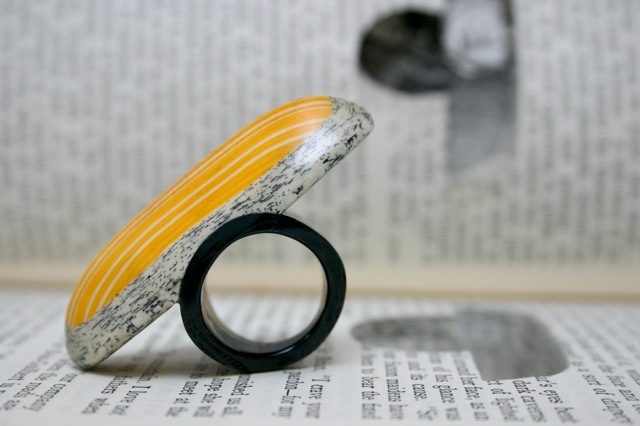 Jeremy May transforms reclaimed books into unique pieces of jewellery carefully cut from the pages of the book. The layers of text and images are visible through the lacquered surface of each piece, which is painted and polished before being returned to the space in the book from whence it came. Jeremy trawls through book markets on his travels to foreign countries; each book chosen has a history; it was bought, read, written on, sold on or given as a gift. In time, it was passed on to a street vendor, a second hand bookshop, or offered to Jeremy. Often geometric in shape, the form and colour of each piece is inspired by a specific quote from each respective book. 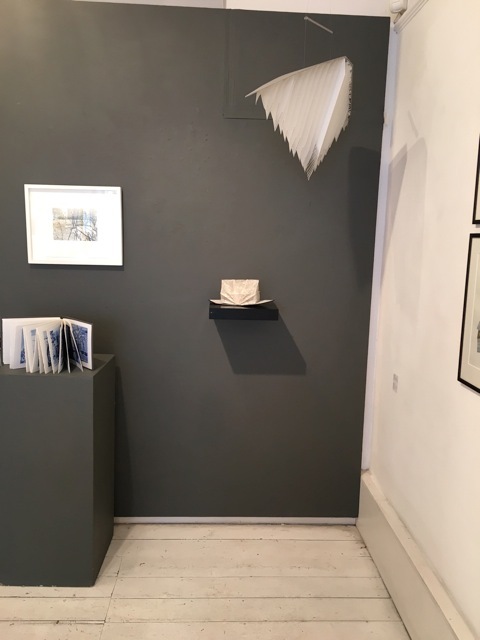 Mono printing from nature, Stef Mitchell makes folded books which create an edge from which the organic accident and intentional mark can be read. 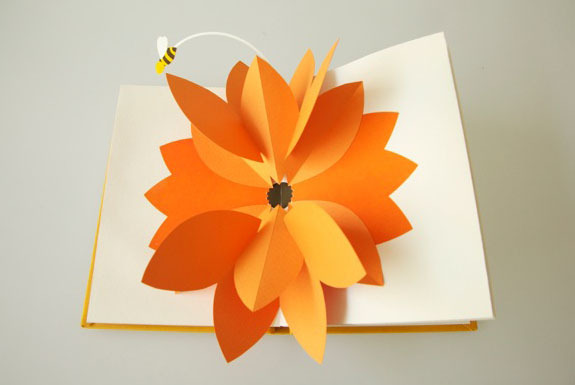 The plants tell their own narratives and the reader interacts through hold¬ing and folding. 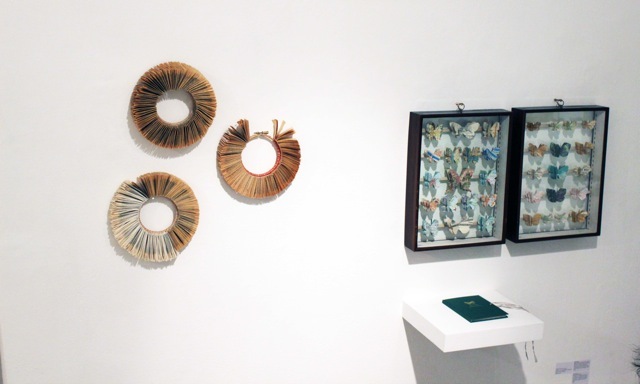 Framed work explores the book as object creating a tension between the read and unread. Walks, set aside, field edges and the effects of weather patterns on plant growth are explored and documented using monoprint working directly with plants. 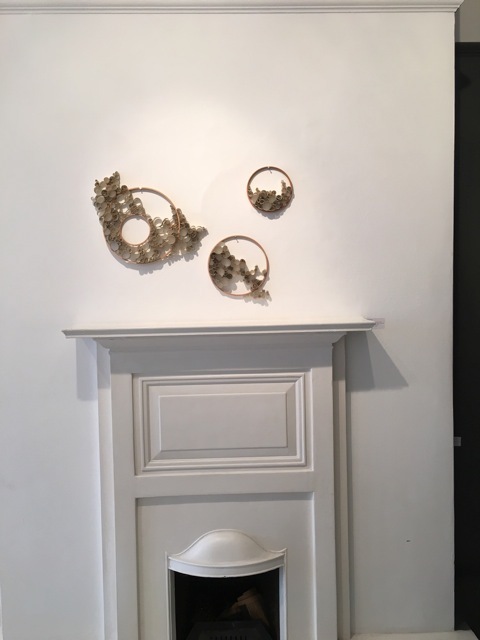 In her current Rock Armour pieces Stef explores the immediate landscape surrounding her studio in the coastal Yorkshire village of Staithes, using motifs based on the rock armour sea defence, the final protective edge between land and sea. 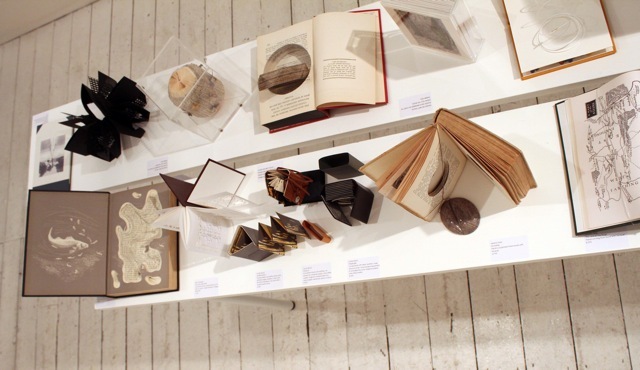 Books represent an important aspect of Anne Rook’s practice and are often closely linked to her other works such as installations, animations, drawings and small sculptures. Repetition is often used as a strategy, connecting images and concepts. Recurrent themes include food production and its consumption. This is playfully represented through the use of fruit labels appearing in several books in which the collecting of fruit labels has been transformed into a comment on the globalization of the food industry. The books are made as single objects or as multiples. The idea of intimacy implied in this handling is important. Erink K Schmidt’s work is heavily influenced by notions of identity that are formed through personal history, memory, and perception. 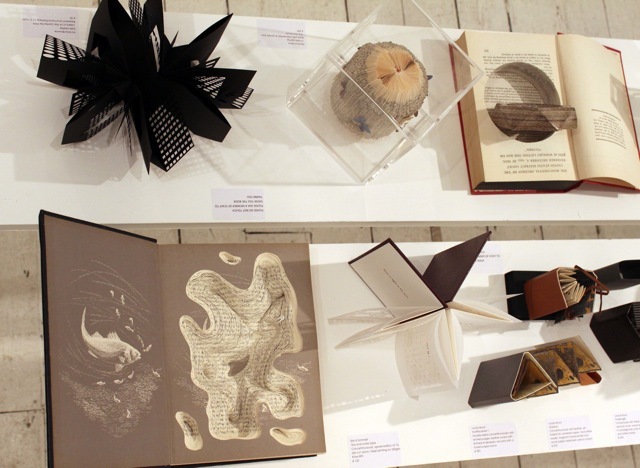 The artist books that she creates focus on individual occasions or experiences and are punctuated by repeated imagery or text, recalling deeply private feelings or memories. Structure and media are as important as the imagery and text in the completion of the work so that these elements come together to evoke an emotional response. 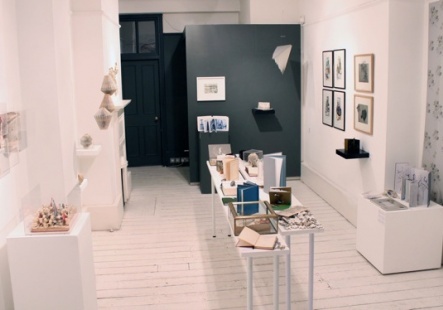 Erin currently lives in the USA, and her work is being exhibited in UK and internationally. 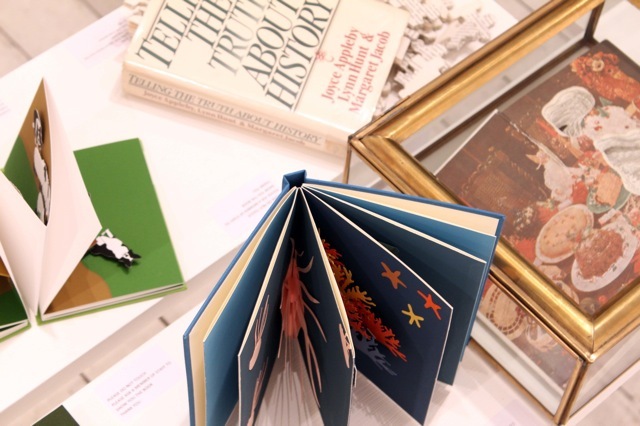 In 2015, she was shortlisted for the Sheffield International Artist’s Book Prize. 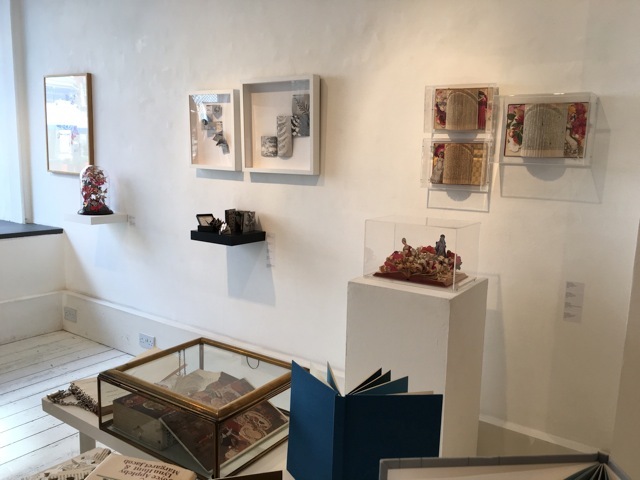 Her works have been acquired by many collections including the Tate Britain, Camberwell College of The Arts, and Bibliotherapy Artists Book Library in Manchester among others. Patricia Swannel works predominantly with print, as well as creating fluid large scale abstract watercolours. Her works are inspired by the beauty of nature and the dark threats to the natural world. 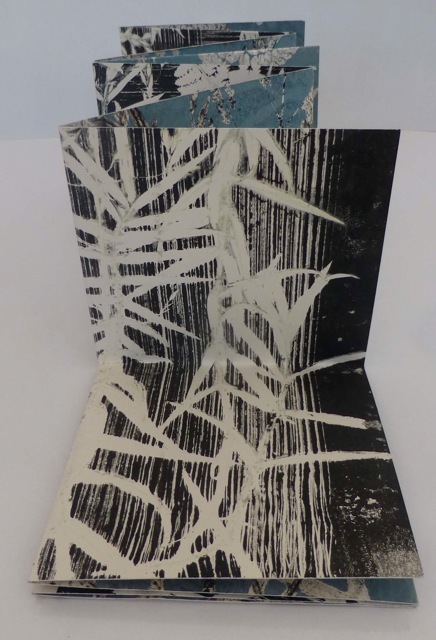 Patricia collects willow branches and leaves, ferns and grasses and uses then on the printing press so that the paper becomes embossed with their shapes and textures. 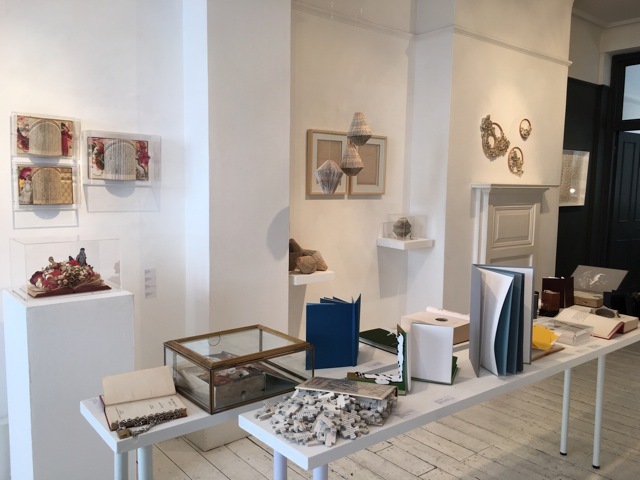 From large trees, to tiny seeds and fragile grasses, flotsam and jetsom are transformed into works which are brooding and meditative, conveying notions of balance, beauty in nature, memory and longing, which are enduring themes in her practice. 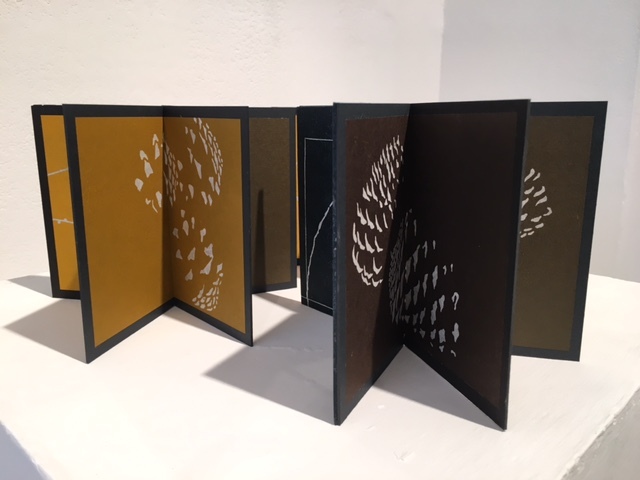 Of her artist book she reflects: “the precise geometry of the Fibonacci spiral and its reflection in the natural world is a long-standing fascination for me. 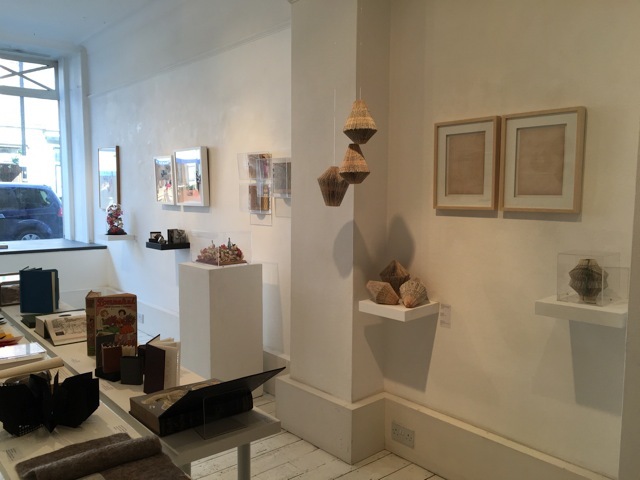 The pinecone reflects this elegant geometry and, like a book releasing ideas into the world, it unfolds to release its seeds, its genetic story.” Patricia trained at City and Guilds of London Art School. Her focus on environmental matters is reflected in her maze for The Royal Botanic Garden Kew at Wakehurst Place which highlights the conservation work of Kew’s Millennium Seed Bank and Legacy; A Reciprocal Tribute, at the Queen Elizabeth Diamond Jubilee Wood, Leicestershire which opened in 2014 and will record the growth of the woodlands in the next 60 years. 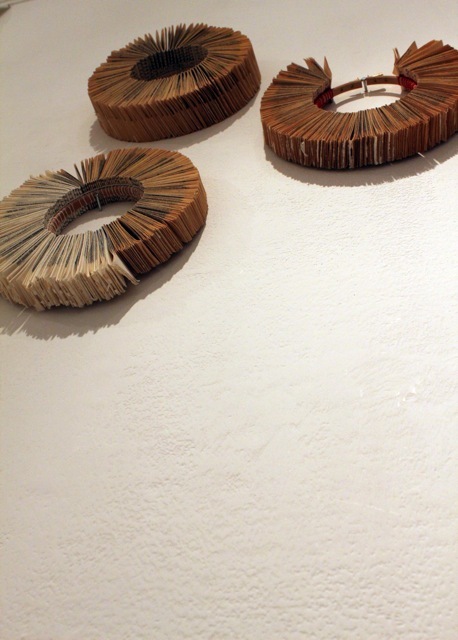 Much of Chisato Tamabayashi’s work is inspired by nature, especially the nature that the artist finds around her in the city. “Our experience of nature is not limited by language, nationality or culture, and in my work I want to communicate in this primary way. I especially enjoy working in the book format, and then transferring and transforming the ideas that emerge in my books to other media. I am interested in the inherently narrative character of the book format, in which the turning of a page is both a revelation and a journey further into a story.” The intention of Chisato’s work is to make the turning of a page change according to time and place and light; to change the flat piece of paper into an object that expresses depths and dimensions. 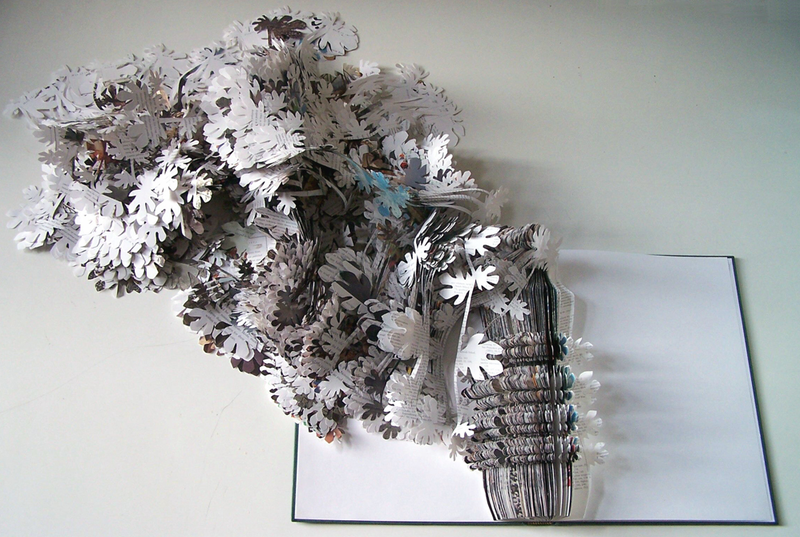 For her, to work with paper is to explore the possibilities of the material itself. 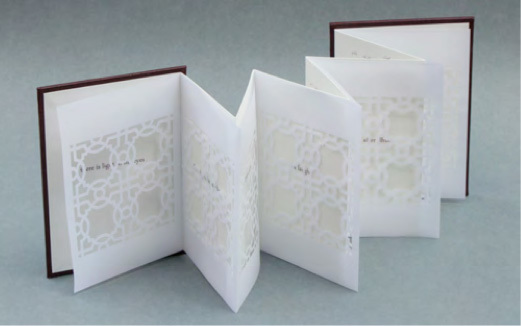 The process of cutting, folding and forming paper is a kind of meditation, and it is often in these focused moments that she finds inspiration for new ideas to follow. Born in Italy, Linda Toigo graduated in Architecture. After working for three years as an urban planer, she decided to change her scale of intervention and moved to London to study Graphic Design. 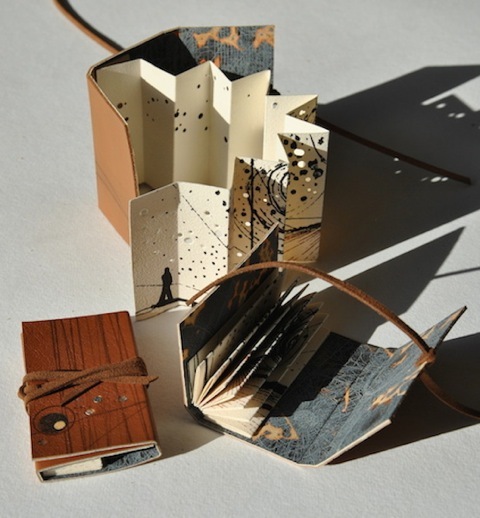 There, she fed her curiosity for book design and book structures, discovering and experimenting the physical qualities of paper. 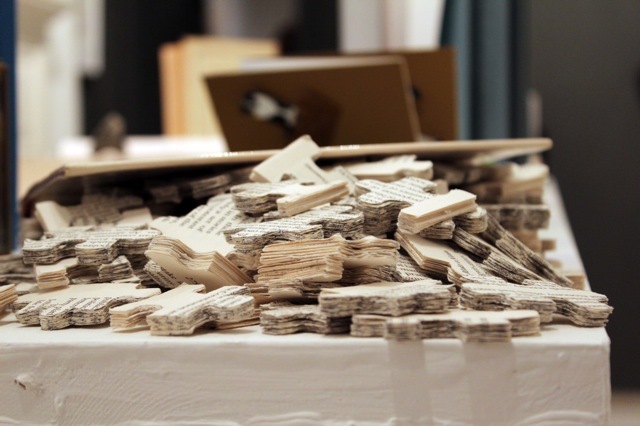 Exploring the field of book destruction and alteration Linda uses traditional, slow paced and laborious techniques to create both small works and large scale interventions with multiple layers of carved paper. Her destructive act, performed with an arsenal of scalpel blades, fire, wire and paints, alters existing visual and written material, extracting it from its original context and endowing it with new meanings. For her paper cut illustrations she takes the inspiration from childhood memories, traditional storytelling and observation of the reality; she creates three-dimensional scenes from sheets of paper assembled together, that draw the viewer in a world full of hidden details and that is often fun, surreal and ironic.